Weather hot. Too hard to word. Summer Preorder Sale. This weekend only (29 – 31st July). Check the list now. Come to store. Tell us what you want. Place deposit. Estimated delivery in 2 weeks. We bring in for you. If no have. We refund you. Ask us questions. If you have. Call if necessary. Games @ PI is hiring! Interested? Forward your resume to info@pi.com.sg. We look forward to seeing some of you working with us! Our announcement of The Games @ PI Auction 2016 has resulted in a number of questions being asked. So we’ll clarify how it’s going to work. If you wish to sell items at the Games @ PI auction, we’ll open to collecting until the 7th of August. Items placed on auction will be sold during the auction period from the 10th to 21st of August. Sellers have the option to collect 60% of the paid bid for their sold items in cash, or 100% in store credit which can be collected from 9th September onward. To place items up for auction, bring them down to the Games @ PI store and fill up a Auction form listing the items being placed on auction as well as the minimum starting bid. Games @ PI will hold on to the items placed on auction for the duration of the auction period. The actual auction will be conducted from 10th to 21st August using a sealed-bid system. Participants will have the opportunity to submit a single Auction Bid Form. The bidder who places the highest bid for an item will purchase the item at their bid value. In the event of multiple bids being submitted, only the first set of bids will be accepted. The winning bidder will be contacted via Email after the auction and will have until the 6th of September to collect their bids. Greetings PI-Fans! Stuff came in today, also staff, but we already know that. We have Sushi Go Party! 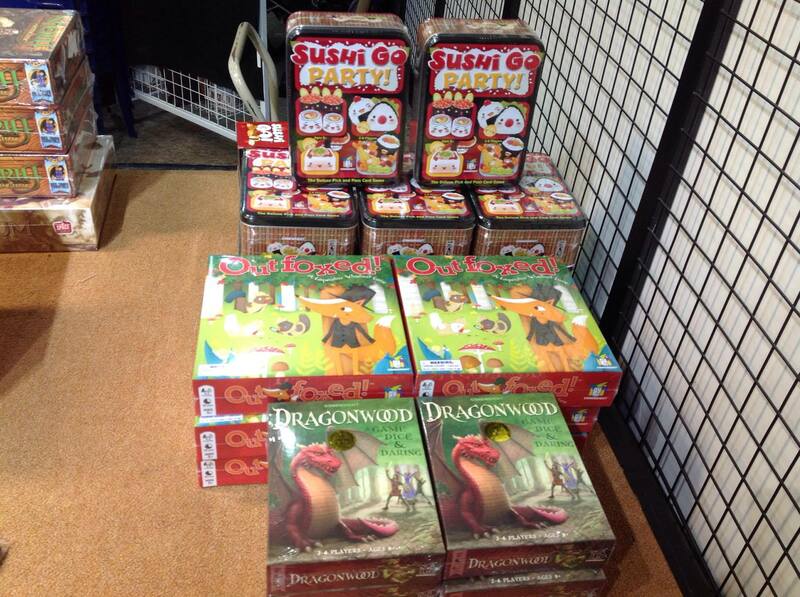 Aside from that we’ve also restocked the original Sushi Go, as well as Outfoxed and Dragonwood. 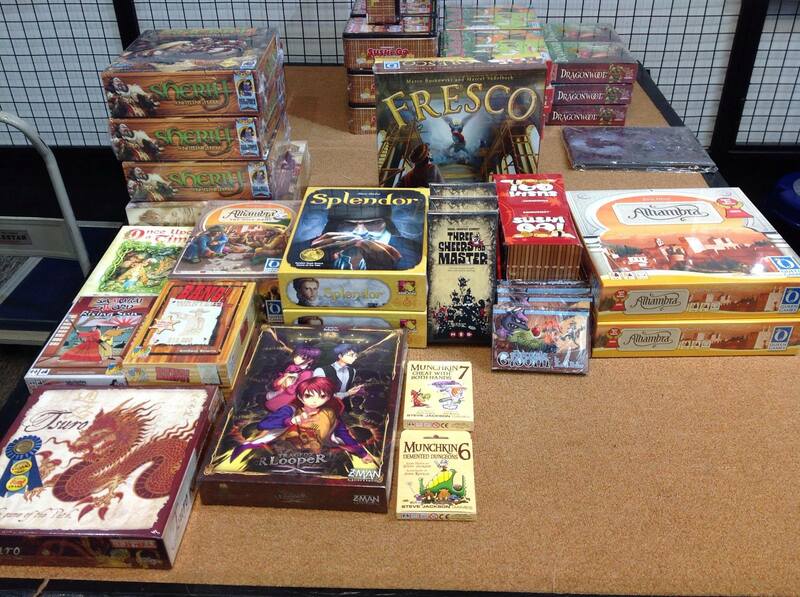 Aside from those we also brought in more of Sheriff of Nottingham, Splendor, Alhambra and more. Have you been waiting for Sushi Go Party! just like some of us here? Come on down to our store to pick your copy up! We’re celebrating PI Day this Friday, 22nd July, with a bunch of PIES! We would like to invite you to our store to have some delicious pies and celebrate board games with us. We’re also offering a 5% discount for Magic: The Gathering Eldritch Moon Booster Box only on this Friday**! **In the event that we run out of boxes, you can still place an order with us on the day itself to get the discount. Aside from that we would also like to invite you to join us in the Shadows Over Innistrad/Eldritch Moon Draft at 7 pm this Friday! Entry fee is $20 and stand a chance to win up to 3 Booster Packs! What Will Hesitation Cost You? Why wait? Come on down to Games @ PI and grab your copy of the Android Netrunner: 23 Seconds Data Pack on street date (14/07/16). Commencing this July 14th, Games @ PI is happy to announce that we will be supporting the Seasons of War – Age of Sigmar Global Campaign. The Realm of Ghyran is engulfed in war, join your Grand Alliance in this crusade! Earn a 10% discount off all Games Workshop products for the duration of the campaign just by signing up! Work your way to a 20% discount off all Games Workshop products by completing the various tasks such as the following to increase your reward! Join us in our Weekend events! Registration for the campaign begins this July 14th, get a Faction Badge* when you sign up at our store! Games played at our store are not restricted to any format of play. Feel free to play Matched, Narrative or Open Play! Age of Sigmar Game Nights will be on every Thursday, from 6pm till 9pm. Tables will be available for play for the duration of the Age of Sigmar – Season of War: Global Campaign! Participate in the Campaign Leaderboards to earn exclusive Games Workshop Age of Sigmar tokens and wristbands! Earn points by completing activities! Playing a Game will earn you 1 point on the Leaderboard. Winning a Game will earn you 1 point on the Leaderboard. Painting up a Warscroll will earn you 1 point on the Leaderboard. Posting a Picture of a Model with accompanying Narrative will earn you 1 point on the Leaderboard. Participating in Weekend Events will earn Extra Points. During the weekends we will be running special events such as Speed Painting Contests or Multiplayer Battles. Mark your calendars for the following events! Every action will determine the fate of the Realm of Ghyran. Do your part in the Season of War!